There’s no way around it, poison ivy is the absolute worst. For those that are highly allergic, a bout with poison ivy is a pus-filled, itchy and painful experience that can last for weeks. It’ll have you running for the plant-free confines of the concrete jungle. But a little education goes a long way in preventing it. Why is poison ivy so evil? Poison ivy contains urushiol oil, which about half the population is allergic to. Even in the winter the leaves of the plant contain this oil and can be absorbed by your skin leading to eczematous contact dermatitis. Reactions differ depending on how allergic you are, or how much oil you come into contact with. This oil can stick to your shoes, your clothes, your bike tires, just about anything that it comes into contact with. Meaning that later on, when you’re tying your shoelaces, you could suffer from poison ivy. Reactions can be mild to severe and can last as long as five weeks. The affected area will become red, rashy and swollen and in time, weeping blisters will form. The blisters from poison ivy will continue to contain the oil and can lead to further irritation and lesions. Ingestion of the plant through smoke caused by burning the plant, or through eating it (don’t do it! ), can cause severe reaction in your throat, stomach and lungs. Poison ivy is actually tricky to identify; it looks like so many other plants that are out there. So how do you find it? Well the general rule is, ‘leaves of three, let it be.’ And that’s pretty solid advice. 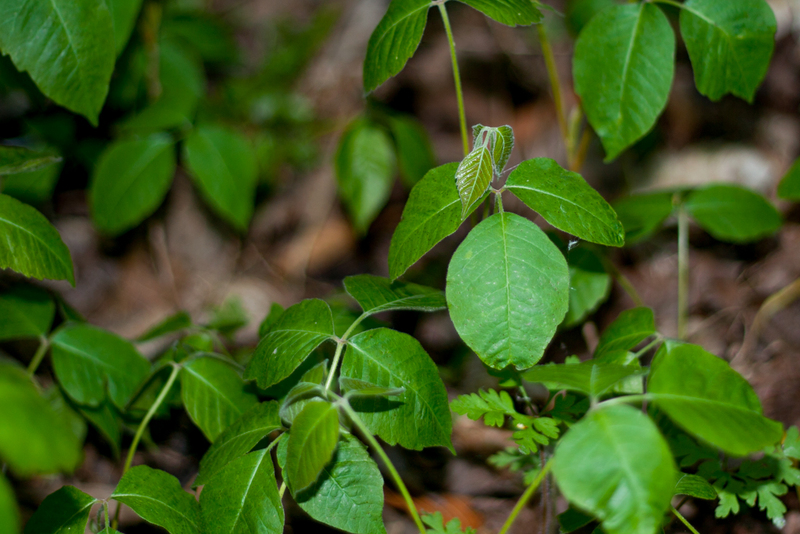 However, there are plenty of three-leaved plants that are not poison ivy. The middle leaf of poison ivy is always a little larger than the two lateral leaves and it sticks out a bit further on the stem than the others. The leaves are generally shiny too. Poison ivy likes to grow on the edge of the forest, along fences or stone walls. It usually sticks pretty close to the ground, although occasionally it will grow up walls, trees or fences. If you’re not sure if you’re looking at poison ivy or not, you could try using an app like Bewilderness to help guide you, or just stay the hell away. The best way to avoid an allergic reaction to poison ivy is, obviously, don’t go near the stuff. But that doesn’t mean you can’t go into the woods. Now you know what it looks like, you can do your best to avoid it when waking through low-lying leafy vegetation. Long pants, and covered shoes will also minimize direct skin contact with the plant. Awareness is everything so if you can avoid it completely you’ve got nothing to worry about. Of course, there are times when you’re in the woods at night, or being chased by a bear, that you just can’t take the time to ID every plant you walk through. So if you do happen to stand in a patch of poison ivy, a few ways to minimize its impact are below. So you touched poison ivy. If you can wash it off within the next ten minutes you’ll be fine. Because the irritant is an oil, you’ll need soap to get rid of it. Sunlight is the common remedy, so if you can get to some in time, do it. If you can’t get to the soap in time, then you may start developing a rash within 24-72 hours. And your course of action will depend on how severe your reaction is. If you know you’re severely allergic, your doctor could give you a cortisone shot. For less severe reactions, oatmeal baths, calamine lotion and not scratching can speed up the recovery process. Zanfel is an over-the-counter product aimed at poison ivy rashes specifically, although reviews say that it does relieve itching but doesn’t reduce swelling.